I believe the thing that binds us as faculty is that we all love to teach. We all love the challenge of preparing the future generation to be well-rounded, well-educated, compassionate, understanding, respectful, enthusiastic leaders. I truly believe if faculty were surveyed about why they became professors or even got attracted to this profession, we would discover a common if not similar reason why we all got into it in the first place. Perhaps we will word it differently, but I bet it is not the financial gain. I believe the pursuit or attraction to teaching is not only influenced by something we saw at one point in life but also it is a desire that we have come to one way or another. It is a desire which brings with it wonderful feelings, joy and fun all around us. I believe that one of the things we could agree upon is that advice is cheap. Accordingly, I will respectfully share with you some cheap advice, which is based on my observations and experience as a faculty member who has lived with students in the dormitories and who has dealt with them on a daily basis. Throughout these years, I have learned that our students are intelligent, caring, imaginative and thoughtful individuals. They love to succeed and the majority of them works hard to accomplish their goals. Undoubtedly, like all of us, there is the wild side of them—the love to party. My connections and dealings with students revealed that they need someone to listen to them, to care about them, to welcome them with a smile or even a handshake as they enter offices. We must realize that the student is the reason we are here. Indeed, students love to see faculty and staff with a sense of humor. They would like to see professors who are sensitive and friendly to them. We must not always use punitive measures. We must be willing to correct students when they are wrong but we must also praise them when they are right. We must realize that students are fragile and delicate human beings who can be broken very easily. They can be reached with gentle words and encouragement. Let’s show our students that we care about them. Let’s show them that we work for them, with them, and not against them. Let’s show it and let’s practice it. Students must see that we are not only teachers but also we are learners where we can learn from them. No one disagrees that learning goes beyond the boundaries of the classroom. Thus, we must go to where the students are. Let’s see how they live and how they interact with each other. One of the things that will allow us to connect with the students is when we bring ourselves to the students’ levels and discuss things with them in a casual setting. We must not build barriers and trenches between students and us. Let’s build bridges where we share our adventures, hobbies, failures and successes. Let’s take learning to them and teach them about the great school, life. Let’s teach them how to assume their responsibilities as active participants in their societies. Remember that we can all make a difference. Let’s build the great RIT community. This community cannot be built without all of its constituents, faculty, staff and students. I know we can do it. Let’s give it a great start. So, that’s my cheap advice. I am very pleased to be amongst you all. 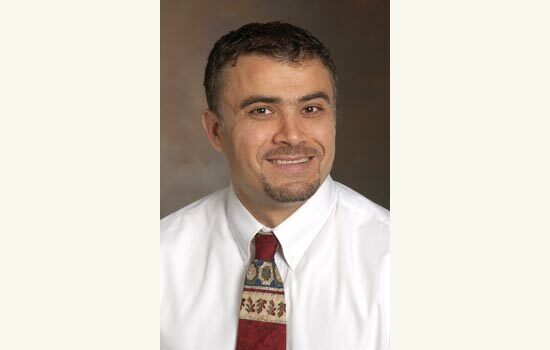 Hamad Ghazle is director and professor of diagnostic medical sonography. “Viewpoints” presents insight and opinions on issues of relevance to RIT or higher education generally. To suggest a topic for a future essay, contact news&events@mail.rit.edu.